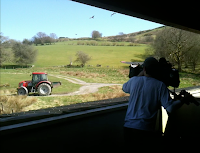 The red kites were the stars when BBC Countryfile came to the farm. 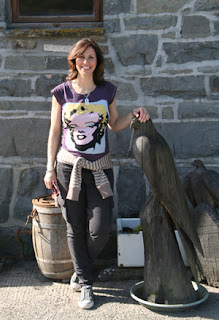 Julia Bradbury (left) was the presenter..
Colin was here on Friday and will be seen feeding the kites. The programme is due to go out on the 24th April - Easter Sunday - 7pm BBC 1. 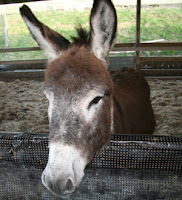 Pedro has arrived as company for Honey, our 30yr old part-bred arab. He's very friendly, loves children, and is just 6yrs old (Birthday 10th September). He's sure to be a hit as he loves to be stroked, and is very gentle. The Trailer Tent Countryside Care party were here for a week, on their annual visit. 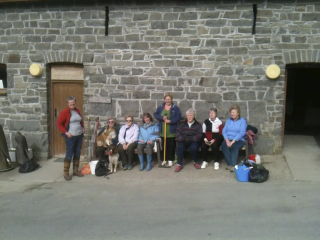 Pictured left are the ladies who have just spring cleaned the kite centre, amongst many other tasks. The gentlemen have revisited the nature trail (putting in fresh marker posts, repainting signs and repairing benches). Again, this is small part of the jobs they managed during the week they spent on the farm.